Turn your LG webOS device on. Hold down the "Setting" button until you see a rectangle on the top-right corner of the screen. Then, press the number sequence 0 0 0 0 and confirm with "OK". 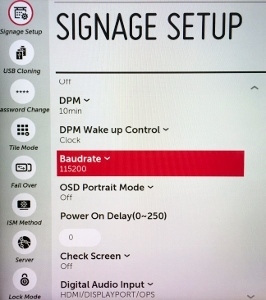 Scroll down on the Signage Setup menu until you find the Baudrate setting. Restart your screen and check if the internet connection is working. How to set your LG webOS screen to portrait mode.